Join us for a discussion about designing for gender equity, a thought provoking exploration of the impact of gender aspects of design on our lives. A multi-disciplinary, multi-faceted panel conversation about designing for gender equity with experts in experience research, human centered design, service design and design strategy that will bring together various points of view on gender aspects of design across different industries, geographies and generations. Nata Abbott leads a Service Design Practice @ USAA’s Design Studio in Austin, TX and is volunteering on a programming committee for BossBabesATX. Nata started her career in international development with UN and EU Development Programs, followed by 15 years of technology, quality and design experience at GE, where she led one of the largest volunteer chapters and community education collaborative efforts. Nata is passionate about design for social innovation, focusing on the issues of inequity in education, healthcare, and employment, and developing community efforts to address local issues with local talent and resources. Sarah Kettles is a researcher, triathlete, cat-lover, backcountry enthusiast, and activist for women in the workplace. Originally from Ann Arbor, Michigan, Sarah moved to Mansfield, TX in 1996 and then to Austin to study at The University of Texas at Austin in 2009. After earning her Bachelor of Arts in psychology, Sarah moved to San Francisco to pursue a career in user experience research, working for Facebook and Airbnb to help develop processes for bringing user's voices into product development and make it easier for individuals with vision and mobility disabilities to access their apps. Sarah also founded Women @ Airbnb in 2016, an employee resource group for women employed with the company, and found a true passion in providing career support through professional development and giving back to underserved women in the community. She moved back to Austin, TX to be closer to her partner and family in 2017 and now works as a researcher for The Zebra, a local Austin car insurance comparison platform. She spends much of her time training for triathlon and working with local non-profits she cares about, like Texas 4000 for Cancer and #bbatx. She focuses on research, providing input and feedback from the women #bbatx serves and Texas 4000 alums to their respective staff and boards to ultimately help build programming that serves those communities better. Erin Hauber leads the Human-Centered Design Practice at USAA. She is passionate about scaling design and innovation culture and practices in enterprises; making design and design thinking knowable and actionable by diverse teams. Prior to USAA, Erin led similar efforts at two global technology businesses Atlassian and IBM. Erin began her career working as a designer for social justice organizations, cultural non-profits, and academic institutions. She was an Assistant Professor of Design at Otis College of Art and Design in Los Angeles and visiting faculty at North Carolina State University. In 2013, her Master of Design thesis “Extending and Enhancing Meaningful Conversation” explored alternatives to college age women’s social networking experiences from a critical perspective. Alexis Du Mond Puchek has 13+ years of experience in User Experience, Interaction Design, Front-End Web Development and Design, and Information Architecture. She has experience working in-house with Fortune 500 companies like Visa and PayPal, as well as in advertising and consulting firms with companies like SapientRazorfish and frog. Her background in financial services, enterprise software, systemic thinking, prototyping methods, and cross-platform and responsive interfaces has enabled her to create world-class solutions for IT services, financial services, ecommerce, automotive, spirits, airline, oil and gas, healthcare, cellular, and banking clients. As a Principal Director at frog, Alexis drives concepting and ideation throughout the holistic program lifecycle and leads the Interaction Design discipline in the studio. She restructured and runs the frogTX intern program, and co-leads the global frog Diversity & Inclusion committee. She is a guest lecturer and speaker at the University of Texas at Austin, General Assembly, the Art Institute of Austin, AIGA Creative Space, and other design firms, student organizations and national conferences. She sits on the UXUI Advisory Board for Austin Community College, Graphic Design Advisory Board for Round Rock High School, and was a 2017 Advisory Board member for Austin Design Week. Alexis is a teacher, mentor, and connector. She strives to lift people up and empower designers to produce exemplary, usable, and accessible design. Nikki DaVaughn is writer, body positivity activist, story teller and all around performer. She is the Founder and Director of the award winning Fat Bottom Cabaret, Texas' only plus size cabaret troupe; and Co-Producer of Midnight Menagerie, a Powerhouse Collective showcasing performers that are queer, of color or of size. She spends her time participating in shenanigry and musing about what it's like to be fat and black in Texas. 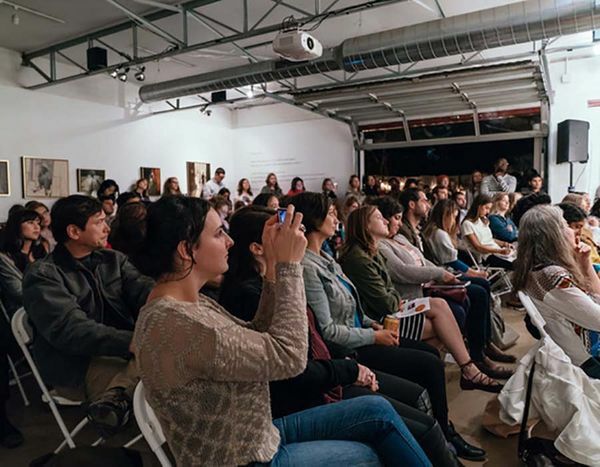 Our event series, showcases, strategic collaborations and professional development programs provide a platform of visibility, outreach and financial opportunity to 1000+ emerging women and nonbinary creatives, entrepreneurs and organizers per year.